For any one that missed it last Thursday I had Knee Surgery. I am happy to say that all is well with my knee. Sunday morning I was able to unwrap and clean my leg and look at the Dr's handy work. I took a picture but Tanya is a spoil sport and wont let me show it. It looks like I got 3 small incisions on my knee. One was on the top sorta in the middle and the other 2 down near the bottom one on left and one on right side of knee. While since Tanya wont let me put a picture of my knee now I grabbed a picture off of my MRI (not that I have a clue how to look at this picture). 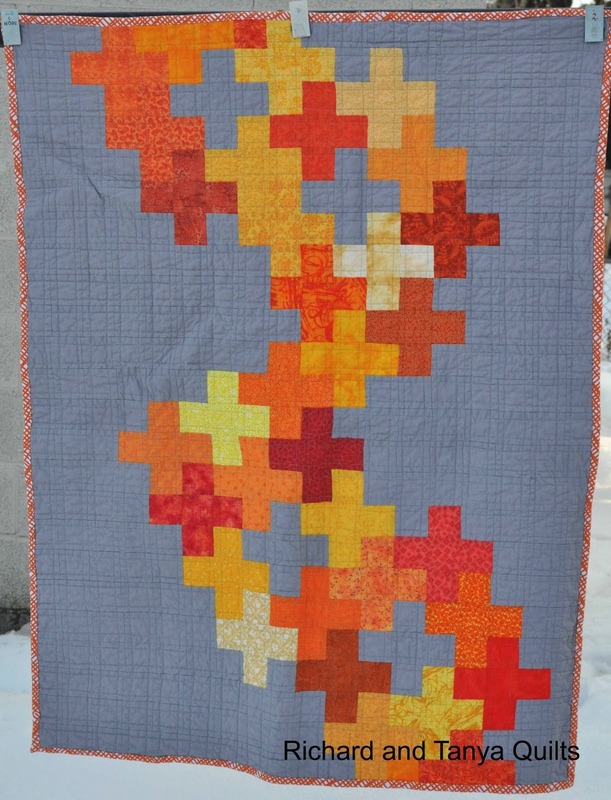 Any way to celebrate my knee surgery I am giving away my Helix Quilt pattern (I thought a little DNA would do me good). For those that might have missed this pattern in the past I made this quilt last year. It is one of my favorite quilt patterns as it was created in one of those attempts of mine to be modern. And of course to annoy Tanya using up more of my orange material which she hates. Below is a pattern more Tanya Style. In fact it is her idea and her pick for colors. Not for free, but now for sell on Craftsy is my Chevron Baby Quilt pattern. We made 3 versions of this quilt this one out of Reunion is my favorite. Any way I am thankful that my knee surgery is over and done and that all I have to do is rest up for the rest of the week. Thank you for all those that thought of me and prayed for me and my family. Glad to hear your surgery went well. I wonder why Tanya would not let you show the picture of your knee? Could it have been that gross or terrible looking? And, thank you for the pattern! Pics of after-surgery aren't usually very pretty, so thank you Tanya for not letting us see what it looks like. LOL Glad you're recovering nicely! Wishing you a speedy recovery and some happy healing vibes. Good luck with your physical therapy. I have been wondering how your surgery went. Glad to hear all went well. Hope you have a speedy, problem free recovery. Glad the surgery went well, Richard. Take care of yourself. Enjoy the rest time :) glad all went well. Glad all went well with the surgery. Will continue to pray for successful physical therapy and recovery. Love that orange quilt!